This week I wanted to explain a little about the whys and wherefores of working with egg whites. A little bit of science in the kitchen folowed by an example recipe where you need to bear in mind what I am about to explain. Why do egg whites foam? If you try to whip plain water into a foam, you won't have much luck. Bubbles that form in plain water quickly pop. That's because water molecules stick together. Water molecules are electrically attracted to each other. They won't spread out to form a bubble film unless you add something that lessens the attraction. An egg white is about 90% water and 10% protein. 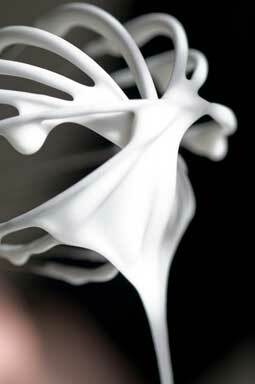 The egg-white proteins are long chains of amino acids that fold and curl into more or less spherical tangles. When you beat an egg white, these proteins uncurl and stretch out. When the proteins uncurl, they expose amino acids that were hidden in the centre of the tangle. Some of the amino acids repel water; these are hydrophobic, or water-fearing amino acids. Some of the amino acids are electrically charged and are attracted to water; these are hydrophilic, or water-loving amino acids. As you beat the egg whites, you also whip bubbles into the mixture. The water molecules and egg-white proteins bump around, jockeying for position. The water molecules are attracted to each other and to the hydrophilic amino acids on the proteins. While trying to get close to each other and to the hydrophilic amino acids, the water molecules squeeze the hydrophobic amino acids out. The best place for the egg proteins is on the surface of the liquid, with their hydrophobic amino acids sticking out into the air. The surface of each bubble film becomes crowded with egg proteins. The water molecules are forced apart by these proteins. Since the attraction between water molecules decreases with distance, the water molecules don't stick together quite as well-they can spread out and make a bubble film. Separating the water molecules so that they spread out in bubble films is only one step in making a meringue. The chicken egg contains a mixture of proteins that makes meringue possible. Some of the proteins form bonds with each other to create a stable network that keeps the bubbles from popping. When the meringue is in the oven, another protein-ovoalbumin-forms bonds that cause the meringue to stiffen. Egg whites at room temperature can be beaten to a foam more easily than cold egg whites. Why can't I use a plastic bowl? Fat interferes with the formation of a good foam-and fat clings to plastic. No matter how carefully you clean a plastic bowl, odds are good that a bit of grease remains behind. It's preferable - and easier - to use a glass or stainless steel bowl to produce a fluffy meringue. Egg yolks also contain fat, so when you separate the eggs, try to make sure that none of the yolk ends up in your egg whites. Why not add sugar at the beginning? Adding sugar at the beginning can double the time you have to whip the egg whites to get a foam. That's because the sugar molecules get in the way of the egg proteins. With sugar molecules in the way, it takes longer for the proteins to find each other and form bonds. When meringue is cooking, sugar helps keep it stable by bonding with water molecules and preventing them from escaping as water vapour. Delaying the evaporation of water from the foam helps keep the foam stable until it stiffens. Adding vinegar (or any other acid) can make the foam less likely to suffer the consequences of over beating: lumpiness, loss of water, and collapse. These undesirable consequences result from too many bonds forming between the egg proteins. When you add an acid to a mixture, you are essentially adding some positively charged particles. These positively charged particles are hydrogen ions-hydrogen atoms that have lost an electron. The hydrogen ions hop onto charged portions of the proteins and leave them uncharged. Proteins that are electrically neutral are less likely to react with other proteins. The Pavlova recipe is a good illustration of these points. One large one or smaller individual ones may be formed and cooked. The taller / thicker the Pavlova the better, as this ensures a creamier centre - about 15cm tall is ideal. Success can also be had by making as per meringue (without the use of a bain marie) but the result is more of a meringue texture than a soft marshmallow inner). Pavlova are best stored at room temperature, chilling them will cause the sugar to sweat out of them.